I own the Roadster #424 and I currently got problem with the transmission. Zuletzt geändert von Rolf68 am 9. Mai 2018, 10:04, insgesamt 1-mal geändert. welcome to the forum! I contacted Talkredius on your behalf. Where does your Roadster live? @Rolf68 Nice Pic! 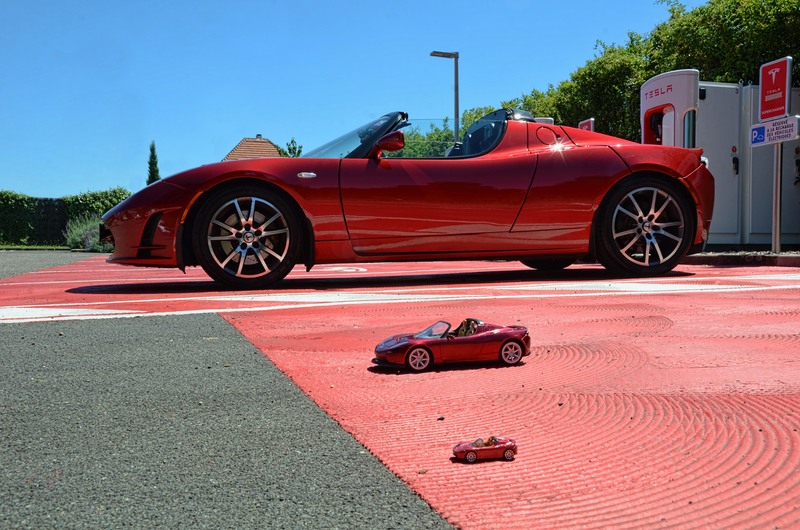 Which of the three Roadster is yours? Thanks for the link, I'll have a look immediately !! Edit : great thread, it's exactly what I was looking for. Now I just need to get directly in touch with those people to know what's inside the transmission and how to make the same thing safely. welcome aboard - nice three roadsters you have - if you need a drive-chain for the middle one please check f.ex. at "Conrad-Electronic"
b.t.w. wich one of the three is compatible with that SuperCharger in the back ? Thanks for the welcome. I don't have the remote control for the RC roadster, the previous owner lost it so it just stand as decoration in my living room. SEW Eurodrive, the company I'm working can do the repair of the gearbox/motor unit. We 've done it 5 times in the past. We'll do not dismount or mount the gearbox/motor from the car. we'll open the gearbox and motor and replace all bearings and sealings, but we could give you no warranty that after the replacements the noise will be gone, e.g it is very difficult to determine the source of noise. Hello mister @Talkredius and thanks a lot for the answer. I didn't see earlier that you replied here, I just had a message that you sent me a PM. It's interesting that you have a replacement unit in stock... Where is it located? Would it be possible to get it and replace the one in my car the time you make the repair, and then switch them again? (I suppose that's what you're thinking about "saving time") My mechanical friend is skilled enough to dismount and replace the gear/motor unit, but he's uncomfortable about replacing the gears inside, as it's "terra incognita" for him. I wrote an email to Tesla Stuttgart to know if they would agree to dismount the unit ans send it to you, but have had no reply so far. The advantage is that I can reach this service center with the car, otherwise I would have to send it on a plate and that would add to the costs. I usually go to the Swiss Tesla service center in Basel-Möhlin but I'm not sure they would be adventurous enough to make that. I'll give a try with them if I got no response from Stuttgart.